Summer is the time to relax, enjoy holidays and watch favorite movies. Luckily, Disney besides big screen releases brings fantastic Blu-rays to their fans. 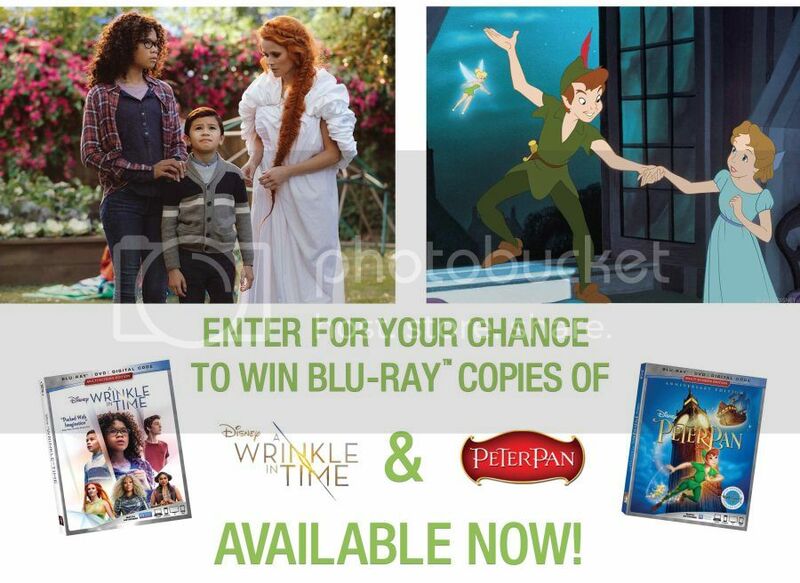 New titles which are available this June include Disney’s "Peter Pan" and "A Wrinkle in Time". In celebration of its 65th anniversary, Disney's beloved flight of fantasy, "Peter Pan," joins the highly celebrated Walt Disney Signature Collection, landing in homes on Digital and Movies and on Blu-ray. With a little faith, trust and pixie dust, every member of the family will let their imagination soar on this epic adventure to Never Land, sparkling with legendary animation, extraordinary music and both all-new and classic bonus features. One of our favorite features is Sing Along so we can join flying adventures with music. We also like that this release includes French version. The second movie which was on the big screen quite recently and now available on Blu-ray/DVD/Digital. The story is based on Madeleine L’Engle’s timeless classic directed by Ava DuVernay and follows Meg Murray, typical middle school student trying to fit in the school environment. Four years ago her father, famous physicist mysteriously disappeared leaving more questions than answers. Bullies at school along with teachers use this fact to hurt Meg and write ugly notes. No one believes that Mr.Murray ever comes back except Meg and her younger brother Charles Wallace. While the girl is struggling at school and can't cope with father's disappearance, her brother, little genius, helps her in every step and also wants to know what happened to their father. With help of Mrs. Which (Oprah Winfrey), Mrs. Who (Mindy Kaling) and Mrs. Whatsit (Reese Witherspoon), Meg, her brother and their friend Calvin take a challenge to travel across the Universe and find Mr.Murray. During their journey, they visit incredible, never been before places, which takes years to reach but kids were able to get there fast. Beautiful landscapes, creatures, weird people, creepy situations and strange encounters. Children also have to challenge their fears, go deep inside their souls and find what they really want and determine who they are. In addition to testing science knowledge, children have to follow the intuition to determine what is going on. The evil, that took Mr. Murray, uses creative weapons and targets on to the darkest memories and wishes to fulfill. Tricky situations created to deceive your vision but to offer something to reduce the pain from the past. No matter if it comes from bullies, demanding parents, or disappeared father, the evil knows which buttons to push. In this story every kid needs to learn something about themselves to find Mr.Murray and get back home. To celebrate June Disney home releases we are excited to give away both titles to one our lucky reader thanks to Walt Disney Studios Canada. The giveaway is open to Canadian residents only & ends June 20, 2018. Would love to watch with my granddaughter, and really want to see A wrinkle in time!! I'd like to watch these with my niece and nephew. I would love to watch these Disney movies with my grandchildren. I would love to watch these Disney movies with my kids! I would love to watch these movies with my niece's little girls. I'd love to watch these classic Disney movies with my two boys. I would watch these with my entire family. We actually got to see 'Peter Pan' five years ago on my birthday which was a pizza party! I would love to watch these movies with my hubby & 2 girls. I would enjoy watching these movies with my granddaughter. I would love to watch these movies with my entire family. These would be wonderful to watch as a family with all the kids and grandkids. I would watch these with my hubby and our four kids. I would love to watch these as a family! I'd love to watch these with my child and my mom! I would like to watch these with my whole family.